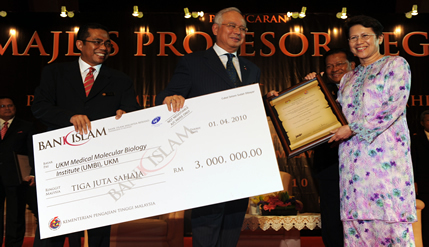 UKM stamped its mark at the launch of the National Professors Council (NPC) with the appointment of its top academics in key positions, in the event that was officiated by the Prime Minister, YAB Datuk Seri Najib on April 1, 2010. Profesor Emeritus Dato’ Dr. Zakri Abdul Hamid, UKM’s former Deputy VC and a long serving scholar, is now the Chairman of the NPC, while our illustrious Prof. Datuk Dr. Shamsul Amri Baharuddin has been appointed the Deputy Chairman. Out of a total of 15 clusters, three cluster heads are also UKM’s top academics – Prof. Datuk Dr. Ibrahim Komoo for Natural Resources and Environment, Prof. Datuk Dr. Halimah Badiose Zaman for Information Technology and Communication, and Prof. Datuk Dr. Noor Azlan Mohd Ghazali for Economics and Finance. This is certainly no mean feat for one research university! Congratulations are certainly in order. It is with pride therefore that UKM salutes these renowned academics for their contributions and dedication to their respected fields and to Malaysia. As UKM celebrates its 40th anniversary, there is really no doubt that “UKM has really come of age”.